657 St. John Church Rd. Sundays — Sat evening: 6:30 p.m.; Sun: 11:30 a.m.
Daily — Wed: 6:30 p.m.; Fri: 9 a.m.
Settlers from Maryland formed the Rhudes Creek Catholic Community of St. John the Baptist in the early 1800s. 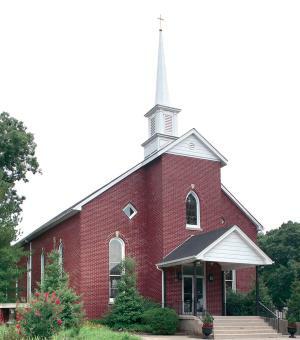 The parish was established in 1829, but the first church was a log structure built by Father Charles Nerinckx in 1812. Father Charles J. Cissell was the first pastor of St. John. The oldest grave in its cemetery is dated 1811, and many of the early families who were buried there have a large number of descendents in the parish to this day. The Sisters of Loretto relocated Bethlehem Academy, a one-room frame building near St. John Church, in 1830, and twenty-six pastors of St. John served as chaplains to the Academy until it closed in 1959. For many years, the pastors of St. John resided at the Academy. The present church is the third in the parish’s history. It was started in 1898 and finished in 1899. It was renovated and brick-veneered in 1967 and has been renovated several times since. In 1972, an all-purpose building was constructed. Primarily a farming community, St. John is growing and changing as subdivisions are added. Today, the parish consists of nearly 650 parishioners worshipping and serving one another. St. John’s is a small country church where everyone knows everyone and where all visitors are welcomed.